What happens when former lovers reconnect after 35 years? A Hindi play with a stellar cast delves deep. 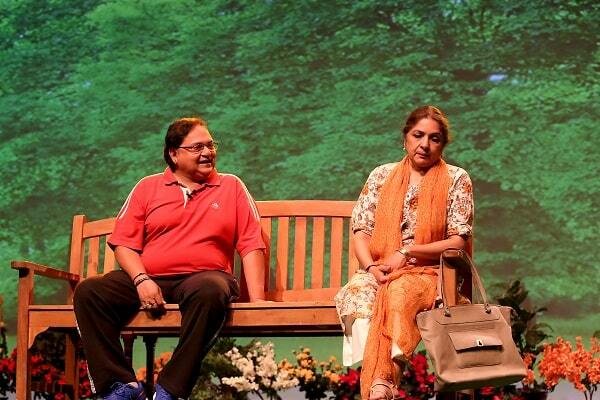 Despite being a story full of emotional memories, what-ifs and unfinished business, Rakesh Bedi’s play Mera Woh Matlab Nahi Tha provided its art-loving Melbourne audience a great sense of contentment. 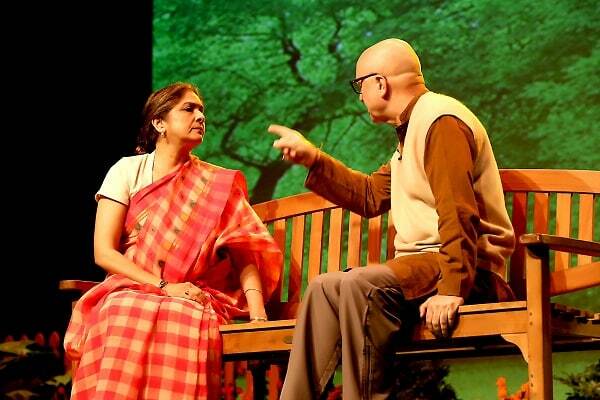 The live theatrical two-hour play with its stellar cast comprising Anupam Kher and Neena Gupta managed to tick all the right boxes for quality entertainment. 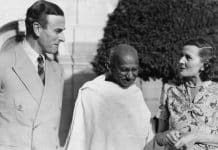 The central pair masterfully covered the emotional territory of childhood sweethearts meeting after a gap of 35 years to clear some misunderstandings. Delivering alternating accounts and flashbacks of their lives since they were separated, they walk us through their memories without slackening the pace of the narrative. 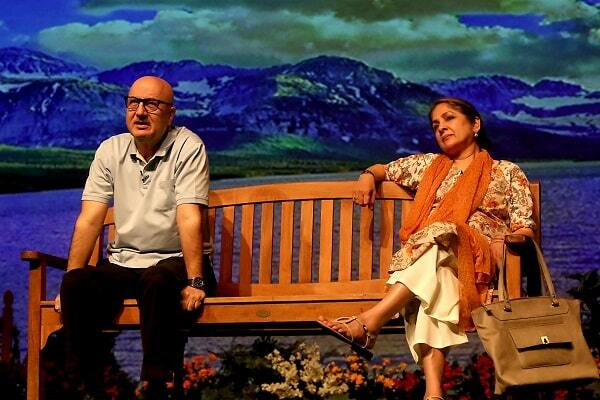 Neena Gupta as Hema Roy and Anupam Kher as Pritam Chopra visibly pour themselves into the execution of their roles. Along with Rakesh Bedi as Kapoor, the nosy but well-meaning neighbour, in a supporting role, the three actors deliver impactful performances. Neena Gupta clearly outshines the other two equally versatile actors as she seamlessly shifts between enacting the role of the feisty Hema and the conservative Nigar (Pritam Chopra’s wife). Anupam Kher offers an impeccably emotive performance as the man who loses the love of his life to be forced into marriage to someone else. Rakesh Bedi, who has written and directed the play, provides comic relief during the tense moments of conversation between the two childhood lovers. As the plot proceeds to unravel the truth behind why the two lovers from Chandni Chowk were separated and their experiences with their respective spouses, the audience is kept engaged, curious and interested. The set is simple yet effective in the form of a public park that provides the location for the former lovers’ rendezvous. Without resorting to any mush or sweet nothings and with little or no physical contact, the lead pair maintains the romantic intrigue. A refreshing change from the melodrama of TV soaps and the glitz of Bollywood cinema, Mera Who Matlab Nahi Tha is a play that leaves you caring about the characters. Did they eventually split again or did they consider a future together, did they go their separate ways or were they on the brink of a new commitment? The end keeps you guessing. 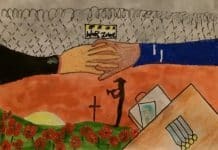 Mera Who Matlab Nahi Tha talks about how circumstances can be misinterpreted by humans in relationships, it talks about the bitter-sweet memories of young love and it talks about age being irrelevant when two people reconnect. In parts clichéd, in parts unexpected, the story can get somewhat predictable but is pulled off by some brilliant acting. During the curtain call, the delighted audience at the Kingston Arts Centre leapt to its feet to give the accomplished cast a standing ovation, and deservedly so.